This isn't exactly what I had in mind when Graham says "always seek adventure!" 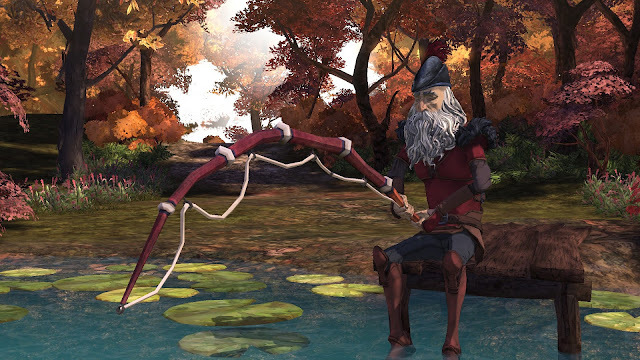 A Good Knight is the name of the fifth chapter for The Odd Gentlemen’s King’s Quest, published by the new Sierra. This chapter is definitely set after the events in King's Quest V but I'm not sure how long after. Judging by Graham's elderly appearance though, I’m guessing it’s not that long before the events of the “present day” where King Graham is bedridden and telling his stories to Gwendolyn. Unlike chapters 1 through 4, A Good Knight was released very soon after the previous chapter – less than a month in fact, which can sometimes be construed as a cause for concern. So is this final chapter to the new King’s Quest a sloppy rush job or is it an ending befitting of kings? Just like the previous chapters, the music in King’s Quest is top notch, borrowing themes used in previous games. Most of the voice actors will be familiar to those who have played the previous chapters and there are no complaints in that department. Just like previous chapters, there are quite a few references to the original King’s Quest games. I managed to notice quite a few to King’s Quest V in this one (and there are even a couple of visual gags that fans of the older King’s Quest, King’s Quest II and King’s Quest VI are going to love). It wouldn’t be a Sierra adventure game without puns and again there are a few of them, but perhaps not as many as other chapters. This was already established in previous chapters but in this chapter it is directly responsible for creating some interesting puzzles. You even have to rely on your own memory of previous chapters in order to progress through the game! You get to revisit (most) of Daventry as it was depicted in the first Chapter which would appeal to those that didn’t like the linear nature of the other chapters. Daventry is slightly emptier, lonelier and desolate compared to the one in the first chapter though, which in a way is fantastic because these are all things that the elderly have to contend with and this chapter brings them to the forefront for the player to experience. The cynical ones amongst us could say that revisiting Daventry was a good way to recycle art assets. Not only that, but you will encounter only 3-4 characters you can actually talk to in this chapter. So it depends if you’re a “half empty” or “half full” kind of person. This chapter is one of the shortest. I completed the chapter just shy of 3 hours. While the build up to the ending was good and I think The Odd Gentlemen has ensured there was little in the way of loose ends, I still felt the ending was flat. There was quite a lot of emotion prior to the end but once you arrived, it was a bit anti-climactic and the day seemed just like any other day in Daventry when really it shouldn’t have – oh well maybe more will be revealed in the epilogue, assuming it is still being released. A Good Knight manages to tie most loose ends, and despite being short and having a rather flat ending, the chapter gives you the chance to revisit the kingdom of Daventry one last time as an elderly King Graham who is starting to lose the plot (mind the pun). Is the game worth $9.99 USD? : Yes. While this chapter is one of the shortest chapters in the series there’s a decent amount of gameplay here and fans of the original King’s Quest series are in for a treat.